” There is a strong perception that that the system of detention in the Northern Territory is failing. It is failing our young people, it is failing those who work in the system and it is also failing the people of the Northern Territory who are entitled to live in safer communities. We have heard that where detention systems are effective they are smaller centres with a therapeutic focus. An approach that is appropriately child centred for children and young people, who at this critical time of their development, including their brain development, are not mini adults and should not be treated as such. ” Yesterday we published a booklet which gives voice to the children who have experienced the child protection system – they have told us their stories either in evidence or by way of recorded story. When we asked one boy about what he had experienced and we asked him if there was any place out there that would be suitable for you to be placed into care? 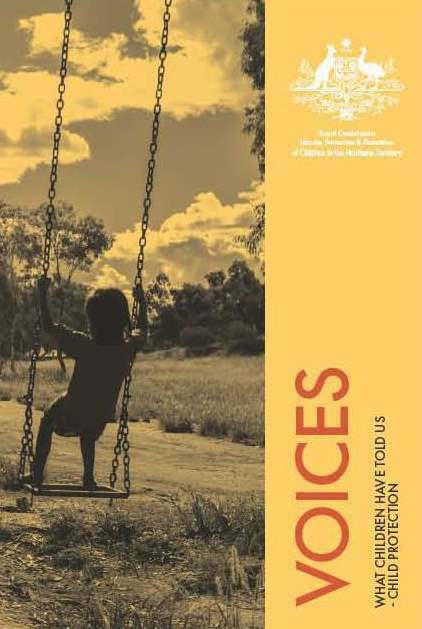 SNAICC welcomes the recent report from the Royal Commission into the Protection and Detention of Children in the Northern Territory for its ability to promote the voices of children and young people affected by a child protection system that is in crisis, which, vitally, provides an insight into the real impact of ongoing failures of government to appropriately respond to children in need. The report, Voices: What children have told us – Child Protection, captures what is often lost in discussions about the best interests of our children – the voices of our children. 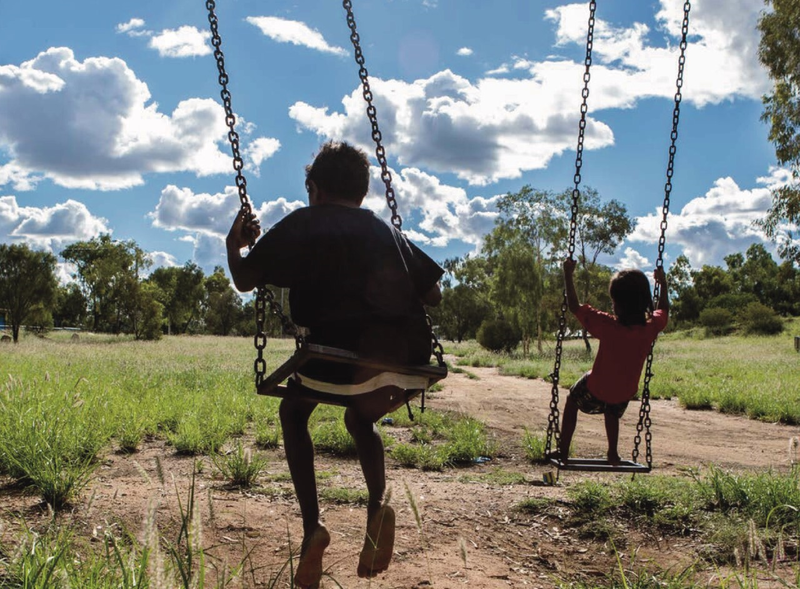 What these powerful stories demonstrate is a pattern of denial of basic rights, ongoing policy and practice failures from successive NT governments, and – bluntly – an uncaring approach to caring for our most vulnerable children. Aboriginal and Torres Strait Islander children make up 89.1 per cent of all children in out-of-home care in the Northern Territory. This is completely unacceptable. 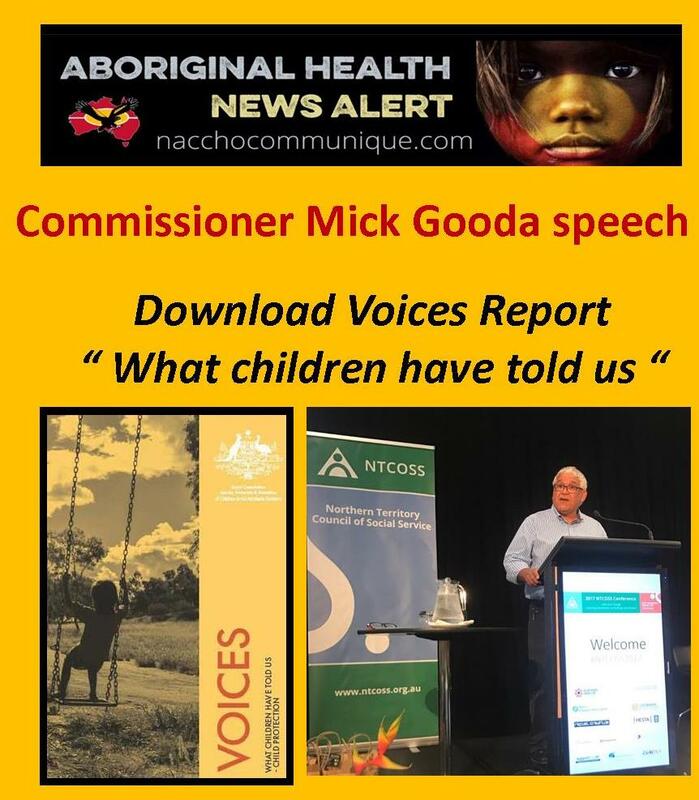 The experiences courageously shared by children and young people interviewed by the Royal Commission further evidence the extensive reform that is required in the NT child protection system, echoing recommendations from SNAICC’s submission to the Royal Commission submitted in February 2017. This is the time for genuine partnership between Aboriginal and Torres Strait Islander communities and the Federal and Northern Territory Governments. We are hopeful that the voices captured in this report go someway to inspire an authentic response to the calls of children to create a new system that enables them to thrive, replacing the current system that perpetuates harm. 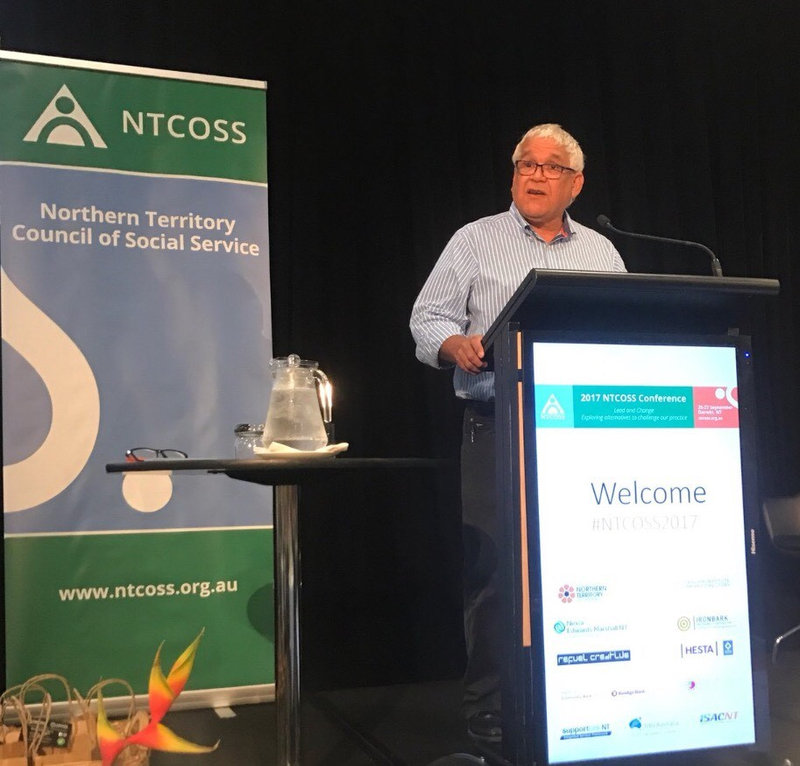 Thanks for that nice introduction Wendy and really thanks for making time for us to come along today and talk to NTCOSS about the Royal Commission. We are now entering the phase leading into the handover of the report when a lot of work is coming together and gelling towards a set of recommendations that we hope will change the whole nature of how we treat children in the Northern Territory and hopefully like Wendy said show the way for the rest of Australia. I acknowledge the Larrakia people the traditional owners of this place we now call Darwin, both personally as a Gangulu fella from Central Queensland and on behalf of the Royal Commission for making us welcome to base our work on your country. I wasn’t here for the Welcome to Country but I saw the young ladies outside and isn’t it great to see the young people do a Welcome to Country. It is a handing over of that particular ceremony, and I was reminded of a tweet the other day about the only thing we do in Australia that represents any cultural aspect of Australian culture is the Welcome to Country. And I thought about that and again it shows that if we pay respects to Aboriginal people we pay respects to everyone in Australia. I’d like to think of Australian culture as being a bit more than football, meat pies and Holden cars. Like I said we are about eight weeks away from our reporting date of the 17th November and it is time for us to bring people together to talk about how we have done our work as a Royal Commission. The first thing we found is that our Royal Commission isn’t remarkable. There have been more than 50 inquiries, reports and reviews on issues of child protection and detention that go to the things we’re looking at. Commissioner White and I understand that people are cynical and fatigued. They told us that in pretty clear and unambiguous terms. Once again another Inquiry had arrived to look at issues of long standing when the overwhelming experience of other inquiries had only seen the situation worsen. Yet this community has continued to provide us with information, to attend community consultations, community forums and meetings. During our time we have witnessed a tremendous desire of people not only to ensure that there is reform, but also as communities to accept responsibility for ensuring the safety of our children. Commissioner White and I were taken aback when we had a meeting with the full Councils of the Northern Land Council and the Central Land Council where half of our time was taken up by communities getting up and saying we’ve got to stop blaming government, we’ve got to start taking responsibility for what we have contributed to as parents. And that tells me that there is a great appetite within the Aboriginal community for change and to take responsibility. As we head to that 17th November deadline we are focused on presenting a pathway for children, families and communities across the Northern Territory. A plan – with a big caveat – if implemented, that will deliver the necessary widespread reform and change for which Territorians have waited for so long. held open and private forums and meetings including with victims of crime, youth justice officers, police officers, foster carers, care and protection workers, organisations and peak bodies. heard hundreds of stories from children, families and communities who have had firsthand experience of child protection and detention in the Northern Territory. Commissioner White and I thank everyone who has provided information to us because without this we would not have been able to fully investigate and ultimately to formulate our recommendations. We have to make particular mention of those children and young people who have had experiences of the youth detention and child protection systems who have courageously shared their experiences with us. Their evidence, and that of their families, frontline workers and worker and others involved in the system, has at times been very confronting. I think this Commission has changed all of us. I was talking to Tony McEvoy our first Aboriginal QC the other day and he told me of a recent experience where just the issue of child protection in another jurisdiction just made him tear up at the memories of what we went through up here, people like us, imagine the young people inside that system. So we’re committed to ensuring that their voices are heard throughout our report. Earlier this year we published a booklet which set out what we were told by communities when we met with them last year. Yesterday we published a booklet which gives voice to the children who have experienced the child protection system – they have told us their stories either in evidence or by way of recorded story. This booklet is available on the ( NACCHO ) website. Please feel free to distribute it far and wide. It’s time our children’s voices were properly heard. Those in the frontline – current and former youth justice, case workers, foster carers, lawyers, judiciary, representatives and agencies and government past and present – as well as the children, families and communities impacted, have told us detention and child protection in the NT is failing. All the evidence we have received indicates that locking children up in Don Dale like conditions does not lead to good outcomes. It doesn’t rehabilitate young people, it doesn’t reduce recidivism and it does not make our community safer. What we have seen is that if you pursue a punitive based approach, these goals of rehabilitation, of reducing recidivism and safer communities, are likely to be unattainable. What we have also found is that we cannot fix the problems within detention centres if we don’t fix the pathways into those places. What we have heard is that many young people can be diverted from this ‘inevitable path’ through changes to legal processes, early intervention and more young people going into diversion programs when they first encounter the youth justice system. Not surprisingly the first contact a young person has with the justice system is generally with the police and is one of the first opportunities to set them on the right path. We have heard that if their initial contact with police is handled appropriately, the young person can be guided towards rehabilitation rather than towards a detention centre. That doesn’t mean a go easy approach – what it does mean though is recognising that the chance is there at an early stage to change the course of a young person’s life for good. For the small number of children who will need to be kept in secure detention, we have heard about very different models to those which currently operate in the NT. Experts here in Australia and overseas have told the Commission that purely punitive approaches are no longer effective nor successful in managing young offenders. Further, we have heard that where detention systems are effective they are smaller centres with a therapeutic focus. Commissioner White and I have said before that we will not be recommending to the Northern Territory Government that they build another big detention centre. 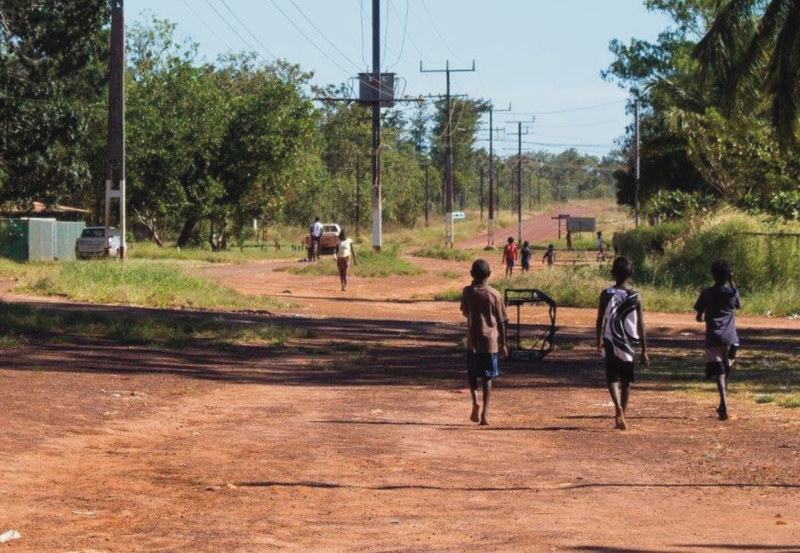 For the small number of children who require secure detention a different approach is needed – with education and training at its core, that provides well-resourced health and wellbeing programs for the children, so that when they do re-enter the community they are more likely not to reoffend. Just as a new approach is needed for youth justice and detention what we have heard during the Commission about the child protection system in the Northern Territory also signals the need for a paradigm change. The Commission has heard much evidence from those with experience of the child protection or welfare system – both personally and professionally. From the children and families we have heard about the impacts of separation from culture, family and kin, resulting from the placement of children into care. DF – one of our Vulnerable Witnesses – as a matter of fact the last witness to this Royal Commission – told us in out last public hearing he and his siblings were placed into care when he was the age of 10. At the time he was removed he understood he would be placed into respite care for just two weeks – he was told it would be just enough time for his Mum to get a house and make some arrangements. He described the heartbreak at the prospect of being separated from his Mum for two weeks. He didn’t know at the time but it would be much longer. DF told us that some months after going into respite he found a ‘care order’ in his foster carer’s house. He said he took it into his room and read it. It was the first time that he understood that he wouldn’t be going back to his mum any time soon. The order placed him into protection until the age of 18. He told us that no one had bothered to speak to him, not his carer, not his case worker, not anyone. He found out about this life changing decision accidentally. Not surprisingly, he absconded from care many times, he was reported to police just a many times. So the system that was set up to protect him actually facilitated his entry into the youth justice system. When we spoke to him about what he had experienced and we asked him if there was any place out there that would be suitable for you to be placed into care? He simply told us I only want to be with my Mother. Challenges in communication, with multiple placements, changes in foster and respite care arrangements, separation from families, interruption to education and a lack of continuity of case management are just some of the issues we have heard. We have heard also of experiences which suggest that the placement into care has delivered poorer outcomes than if a child had remained within their community and within their family. We also heard of cases where we were told that a child, in the care of the CEO, was in need of care. If a child must be removed then they must be provided with the care, support and stability that any child is undeniably entitled. We know that those who enter the child protection system have a higher chance of ending in the detention system – we call them the ‘Cross Over’ kids. This speaks to the need for early intervention and to seek to close off that seemingly inevitable pathway. Our goal should be to help prevent children entering protection by having greater capacity to identify the triggers that indicate a family is in need, that needs support early and well before the statutory system intervenes. It is the early actions which will have the greatest impact for them and their communities. For example, it has been found that pathways into juvenile justice can often stem from childhood trauma that remains unaddressed. There are huge demands on child protection systems across Australia and too often children end up languishing in such systems and any assistance is provided too late. And successive inquiries have repeatedly found that child protection systems are based on out of date assumptions yet we have failed to see reform efforts that are based on an understanding of the scale of child abuse and neglect. We have had experts analyse the Niland Report Inquiry and they tell us the kids that were screened out for intervention in that State mostly me the benchmark for intervention. We are also told that it is easy to translate those figures to the Northern Territory. From our perspective that means that there is this great wave of children out there and families out there in dire need of support. And the statutory child protection system, no matter how good you make it, won’t be able to cope. The emphasis on early intervention and early support will be the cornerstone of our recommendations. The goal for us all must be a system that is child focused, community involved, evidence based, locally tailored and providing support for children and families as early possible. It is fitting I close with what a couple of stories from children and I’ll go to the second one first. And they are positive stories and I think we have to be positive. Commissioner White and I decided early in this Commission that if we can’t think positively about the future of children we should resign and let someone else do this job. Because we have got to remain positive because if we don’t remain positive then I think it is all lost. In all the negative stories we got told about child protection one young woman described her case worker taker her out to lunch and talking with her for about an hour. This was apparently such an unusual occurrence for this young woman that it stuck in her mind for years. Commissioner White and I made a habit of ensuring that we ask every vulnerable witness who came before us, particularly in the youth detention system, were there any good guards? Were there any good youth workers? Because we had heard plenty abut the negative youth workers. And every one of those children said of course there were good youth justice workers and they were in the majority. And then we asked a follow up question – what made a good youth justice worker? And every one said the same thing. They spoke to us, they treated us like humans. And what does that tell us about the needs and wants of young people? They just want people to talk to them and treat them like humans. I have to end by acknowledging the work of the hundreds of people and organisations – many represented here today – who have contributed to the work we are undertaking. Like I said we received more than 320 submissions from individuals, community organisations, peak bodies, academics, government, non-government and other organisations. In the face of the challenges that children and young people confront in the NT, this is so encouraging and shows Commissioner White and I that there are so many people willing to work towards change and improvements in the system. And indeed put the kids of the Northern Territory in the centre of all of our considerations.